Jesus said, "I am gentle and humble in heart." Jesus also said, "blessed are the meek..." But when he walked into the temple during Passover he revealed gentle, humble and meek does not mean soft and week. When Jesus saw animals and money changers intermingled with would-be worshipers, he put a decisive end to it! 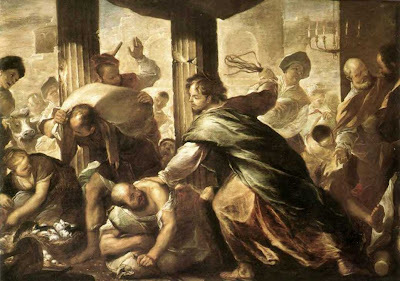 He cleansed the temple with a word and whip. John offers Psalm 69:9 as explanation for Jesus' outburst: "Zeal for your house consumes me." Jesus was passionate to see the house of God remain what it was intended to be: Consecrated for God's sacred use. Just as a person can be consecrated, set apart for God's purpose (the word for this is saint), so can a building (sanctuary is the word for this). The only place in the world that was set apart to be a habitation for the presence of God was that Jewish temple in Jerusalem. If zeal for God's house, for the temple of God's presence, consumed Jesus when he walked the earth, let's follow that logic through. After Jesus went to the cross and ripped open the curtain that separated us from God, he gave us clear access to the presence of God. Those of us who put our faith in Jesus now become the temple of the Holy Spirit, who is in us. So if zeal to clean the temple consumes Jesus, and we are now the temple, what does that mean for us? It means Jesus has a zeal, a burning desire to cleanse us and make us holy! One reason I believe Jesus so freely cleaned the temple was ownership. Anywhere else Jesus went, he was a guest in people's homes. But that day he walked into the temple, he was the host. He was home and he had authority to cleanse his own house. The question each of us has to ask ourselves is what role Jesus plays in our lives? Is he a guest in your home? Do you call him over for a visit during times of need, only to shuffle him out the door when you're done with his services? "Thanks for turning that water into wine, Jesus!" "O.K. see ya' later, Jesus!" Or have you come to the realization that he is the owner of the temple? His burning desire is to purify it, to make it holy, separated for God's pleasure and your own benefit. As you surrender each and every corner to the Lord of the temple, you will see him make a wonderful change of your life! But you must decide once and for all: Is Jesus a guest in your life, or is he the owner?